Explain to your counselor the most likely hazards associated with exposure to ants and bees and what you should do to anticipate, help prevent, mitigate, and respond to these hazards. Discuss the prevention of and treatment for health concerns that could occur while working with ants and bees, including insect bites and anaphylactic shock. Make a scrapbook of the 20 insects you observe in 4a(sic -This should be "5a"). Include photographs, sketches, illustrations, and articles. 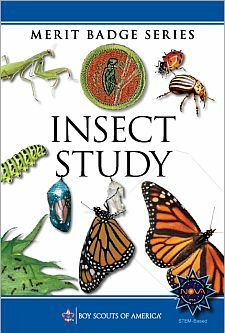 Label each insect with its common and scientific names, where possible. Share your scrapbook with your merit badge counselor. Discuss the use of integrated pest management vs. chemical methods of insect control. What are the advantages and disadvantages of each? Observe an ant colony in a formicarium (ant farm). Find the queen and worker ants. Explain to your counselor the different chambers found within an ant colony. Study a hive of bees. Remove the combs and find the queen. Estimate the amount of brood and count the number of queen cells. Explain how to determine the amount of honey in the hive.